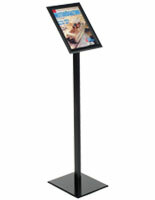 Features a signholder size of 8-1/2" x 11"
Advertise specials and promotions indoors with this 8.5x11 floor standing sign. 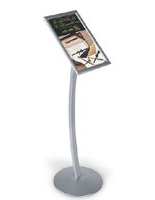 This snap-open poster display is commonly used by restaurant and bar owners to promote menu items or other events within their establishment. 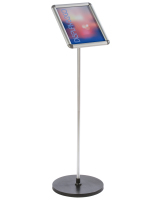 This floor standing sign has an angled holder to display 8.5" x 11" signage at an optimal viewing angle for the public. Each quick-change snap frame enclosure holds a poster under a clear plastic lens which will help protect images from dust and fading. 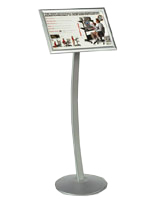 This free standing sign is is ideal for businesses that frequently change menus or messaging. Simply snap open the frame sides, slide graphics under the protective acrylic lens, and you're done. 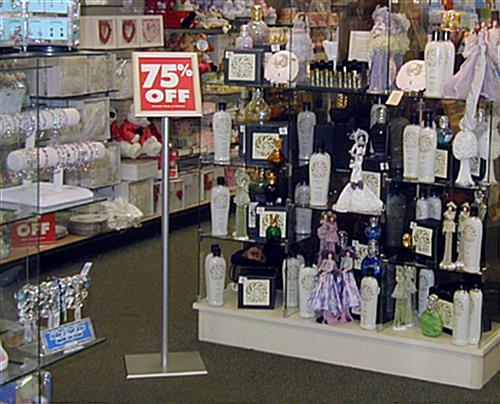 Each 47" tall aluminum sign features a silver finish that complements or blends with fixtures and decor in restaurants, retail stores, bars, or lobbies. The relatively small footprint consumes very little floor space while providing maximum stability for public areas. 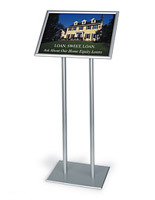 This sturdy freestanding sign holds letter-size signage which is great for displaying sales posters or advertisements. Banks often use this style stand to identify where the waiting line starts. Each signage hold features mitered corners and the frames are supported by a single base post. 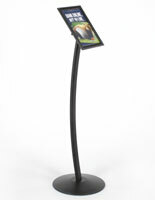 This print holder ships unassembled in one box which helps to minimize shipping costs. 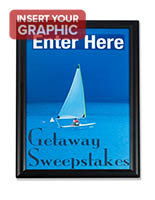 Each snap-frame sign, also known as an angled poster holder, includes all hardware needed for assembly, except a screwdriver. One person can easily assemble the simple unit in approximately ten minutes. This silver finish sign, also known as a metal signage display frame, is made with quality materials that are suitable for use in any busy commercial environment. It's great! The product is nice looking and is sturdy. Thank you so much for the great review, Elizabeth! 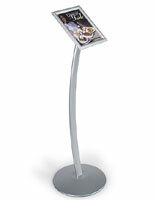 We hope you enjoy your new menu stand! Came quickly and was exactly what we needed. Looks great! Thanks for the great review, Kristin! This stand looks great and works great. Not completely easy to assemble, but I am not a craftsman. I recommend it to anyone. It looks awesome. Thanks for the feedback, Cynthia! We hope to hear from you again soon. Love the simple lines and solid construction of the menu stand displays. Highly recommended!